Our exotic series of Moon Incense Stick encompasses "Moon" that is widely popular in the market for creating a magnificent environment. The fragrance of this Incense Stick is truly enchanting and mysterious. We have used premium grade Biotic Materials, essential oils, and chosen fresh flowers to prepare the sticks in long sizes. This array of exotic moon incense stick is ideal for rituals performed during worshiping. The natural fragrance released by this moon incense stick is also admired by the aromatherapy centers and spas to enrich their clients experience by enhancing the feel good factor. 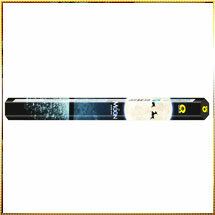 We provide Moon Incense Sticks in attractive packaging imprinted with exclusive designs. However, the prices are comparatively low when compared with the quality and total value of the product.